HYDERABAD: It was a tough call for Sunrisers Hyderabad but they had no other option than to strengthen their batting. The hosts brought in Kane Williamson, Ricky Bhui and Abhishek Sharma to strengthen the middle-order but still came short against Delhi Capitals at the RGIC Stadium on Sunday night. The hosts crashed to a 39–run loss as pacers Keemo Paul (3/17), Kagiso Rabada (4/22) and Chris Morris (3/22) proved quite a handful for the SRH batsmen. Chasing a modest 156 for victory, it was business as usual for SRH openers David Warner and Jonny Bairstow as they strung another half-century partnership. Bairstow, who had made a 48 when the teams met the previous time, did the bulk of the scoring early on. After being quiet for eight overs, Warner opened up when he lofted Axar Patel over the deep midwicket boundary for his first six but Bairstow (41; 31b, 5×4, 1×6) fell in the next over to Keemo Paul. The duo added 72 in 9.5 overs but once the partnership was broken, it was a familiar story for SRH. Williamson (3) and Ricky Bhui (7) fell without much ado and the asking rate kept on creeping upwards. This put pressure on Warner and the southpaw succumbed to Rabada after making 51 (47b; 3×4, 1×6). Smelling blood, the Capitals stepped up the ante and the SRH batsmen committed harikari. SRH lost eight wickets for 15 runs in 21 balls. Earlier, left-arm seamer Khaleel Ahmed, who is playing his first match of the season after coming off an injury, made an instant impact as he struck three vital blows to derail the Delhi Capitals’ innings. 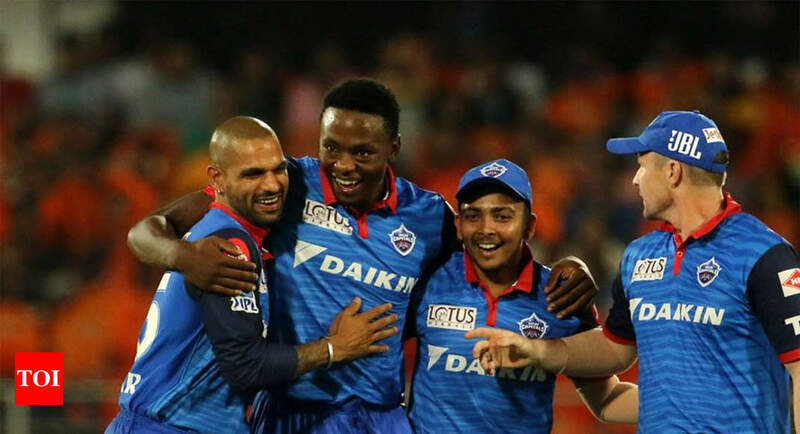 The 21-year-old struck once in each of his first two overs within the powerplay and then returned to dismiss the dangerous Rishabh Pant in his last over as the Capitals could muster a modest 155 for seven. After Prithvi Shaw and Shikhar Dhawan fell with just 20 on the board, Colin Munro, who is playing his first match of the season, went after the bowling to step up the tempo. The New Zealander struck Sandeep Sharma for two boundaries and then went after Ahmed. Southpaw Munro hammered a four and six off the left-arm pacer. Munro (40; 24b, 4xr4, 3×6) struck two more sixes – one off Ahmed and one off left-arm spinner Abhishek Sharma – before falling. At 69 for three, things were not rosy for Capitals but Shreyas Iyer and Rishabh Pant put their heads down as they tried to give their bowlers something to bowl at. Skipper Iyer, who is one of the most underrated players in the country, came up with yet another steady display with the bat.